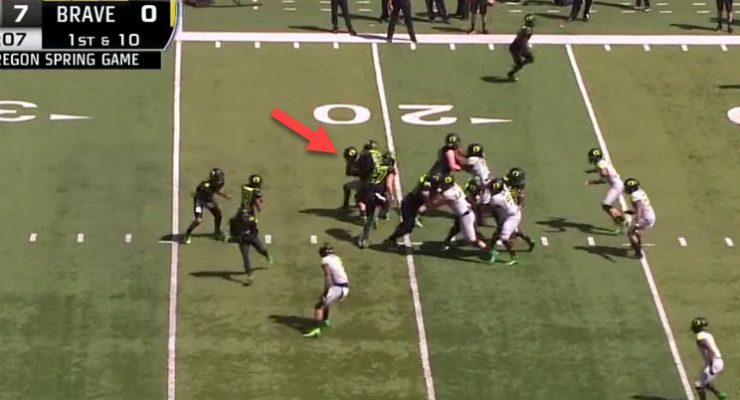 We, at FishDuck.com, have presented several analyses of Oregon’s Spring Football Game, all featuring a theme of how the new and improved Duck defense stopped different offensive plays. This week there’s not a definite theme – other than they are “delicious” ingredients to savor. Like a hearty Gumbo’s different flavors, these three plays come together to make a delectable concoction. Two pleasures from watching this year’s spring game were seeing the significant improvement of almost all of the guys who played last year, and also getting to see impressive players I hadn’t known about. Last week we featured a GREAT block by Redshirt Freshman Offensive Tackle, Logan Bathke. Who knew? In watching the drills, one guy definitely stood out from the others. Number 25 just kept making beautiful tackles. I didn’t know who he was; I had to look him up; Brady Breeze. I knew his background, but I had no idea he was that great a tackler. And, damn, he never got to play last year. This screenshot below shows what I saw at the clinic from Brady Breeze. There are some very interesting schematic adjustments made by the Duck defense: It’s a 4th and 1, and the offense comes out in a wide, bunch trips formation, trying to take defensive players “out of the box” to soften the defensive front. But watch Breeze, the left safety, creep up to become essentially a linebacker. The offense (below) runs an Inside Zone to their left, with double-teams on both Defensive Tackles [in a 4-2 alignment]. But RLB Troy Dye fills his B gap, and MLB A.J. Hotchkins fills his A gap. The ball carrier, Tony Brooks-James is forced to cut to his right, where he encounters Mr. Breeze in the C gap. Just concentrate on Brady Breeze’s form on this tackle. It’s a beautiful thing. Oh, Tony Brooks-James, because of his hard-to-tackle-him-well skill, made his 1 yard [barely], but it definitely wasn’t because of Breeze’s great attack to the LOS and great tackle. 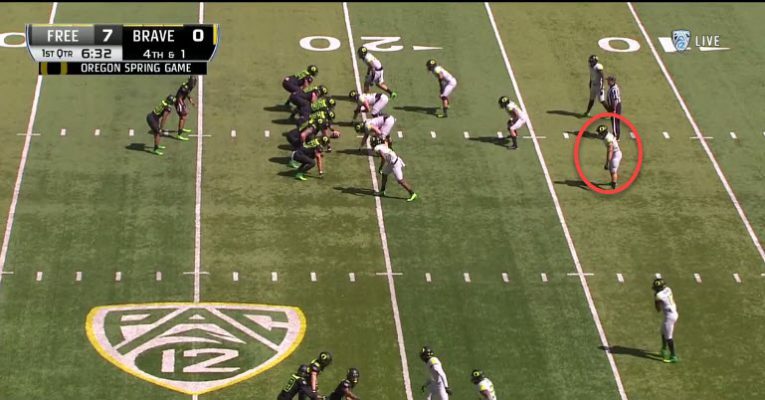 The entire front 7, and the other safety also show a physicality we never saw from Oregon’s defense last year. 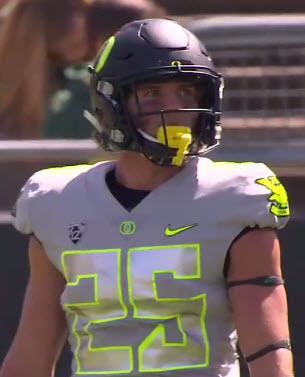 I’m hoping we’ll be seeing a lot of classic tackles over the next four years by number 25, Brady Breeze. Our next featured defensive play below shows three young men who continually made great plays in the spring game, whom I expected little from this season. Sophomore OLB Bryson Young got to play a little bit last year, but I had no idea how good he would be. Already in recent weeks — we’ve featured Bryson beautifully containing a Jet Sweep and perfectly forcing a Counter Trey to the outside, where he made the tackle. This week we show Bryson Young (above) executing the regular contain technique against a Counter Trey, attacking the outside shoulder of the pulling Right Offensive Guard, and forcing the ball carrier to run inside. There “might” be a hole for TBJ if he could follow his pulling H-back. But Young attacks so quickly and aggressively that TBJ can’t even think about it. That’s a wonderful example of the LB “dip and rip” [through a blocker’s shoulder] technique that I’ve been waiting for, for a very long time. Kampmoyer is truly the “Hunter” of the ball carrier. So TBJ (Red question mark above) looks to his right. Nope. Defensive Left End and green arrow above, Hunter Kampmoyer [There’s that dude, making a great play AGAIN] has his side contained beautifully. Great technique and filling gaps! So TBJ tries the middle. Sorry, Tony. 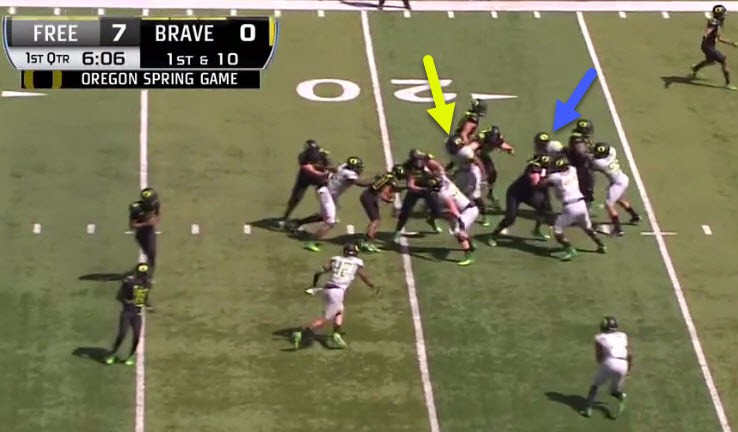 Will Linebacker Troy Dye (Blue arrow above) has done a great job, of keeping leverage on the ball carrier, and then Troy beautifully fills the inside area. Kampmoyer and Dye are joined by another guy who played an excellent spring game, Defensive Right End, Elijah George, (yellow arrow above) who is wonderfully playing the 4 technique. 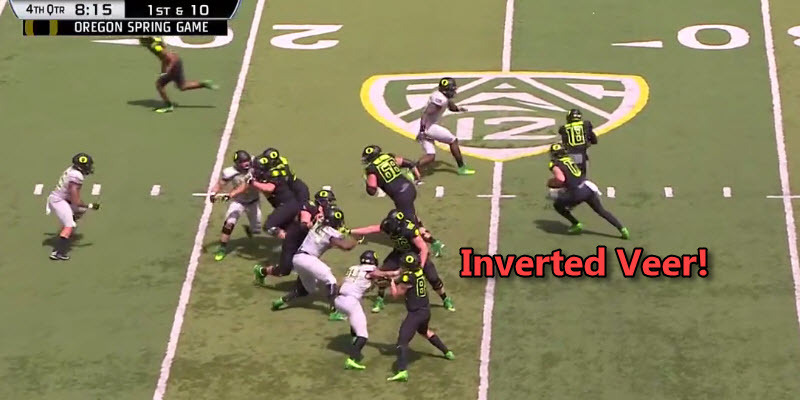 The improvement in the defenders above by Jim Leavitt is impressive. 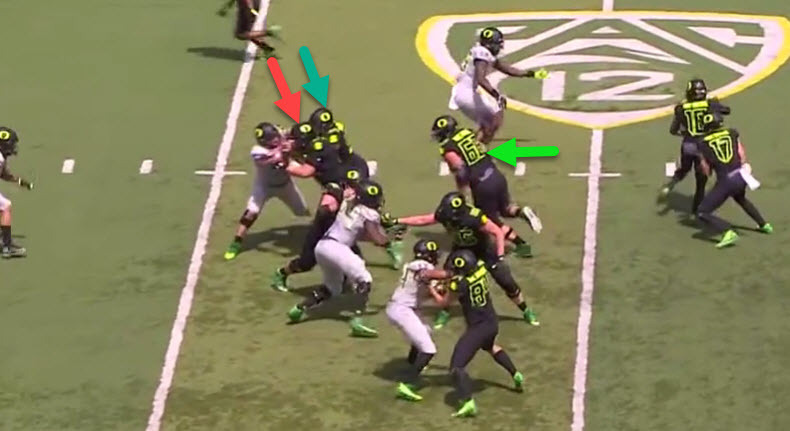 This is when the QB [on this featured play, freshman Braxton Burmeister] reads the unblocked DE [Bryson Young] [Remember: In the Ducks’ 4-2 alignment [pictured below], an Outside Linebacker replaces the Nose Tackle, the 2 Outside Linebackers then become Defensive Ends, and the 2 Defensive Ends become Defensive Tackles. Got it?]. A beautiful look for Oregon … power! If the unblocked DE (above) didn’t take the Jet Sweep running back, the QB would have given to the RB [Charles Nelson] the ball. But because the DE stayed with the Jet Sweeper, QB Burmeister kept the ball and ran a classic off-tackle “Power” play. Want to see a great double-team? 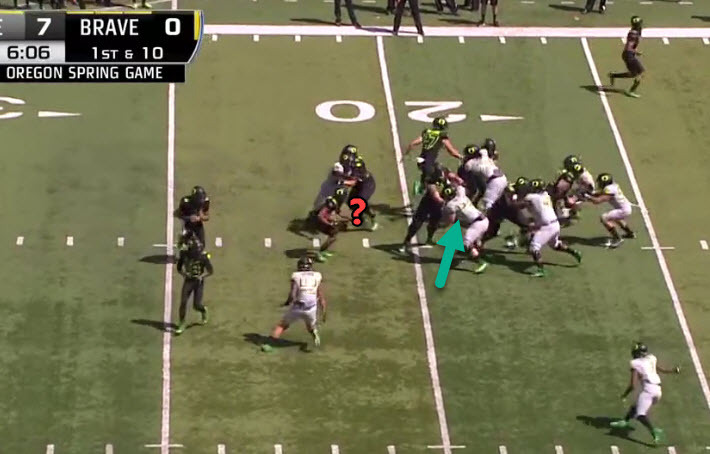 Watch the Right Tackle [ Green arrow above and No. 54 Calvin Throckmorton] and the Right Guard [Red arrow above and No. 61 Valentino Daltoso] power-up on DLT Hunter Kampmoyer. In “zone” blocking, necessary “combo” blocks always start with a double-team, but then one of the blockers has to come off that double-team and block a LB. In a “power” blocking scheme, using a true double-team and a pulling blocker to block the play-side LB, the two blockers know they get to stay together and try to drive the defensive lineman back into the off-side LB. In this case, after driving Kampmoyer [who played a great spring game] almost into the play-side LB, Daltoso knows his job is well done, and he comes off the double-team to seal the back-side LB. Meanwhile, Throckmorton beautifully finishes his job by driving Kampmoyer onto his back. Yeah! And anyway, it was a beautiful 6-yard gain. That’s POWER FOOTBALL! — wonderfully supplemented by finesse and deception. Well, did you like your Gumbo? 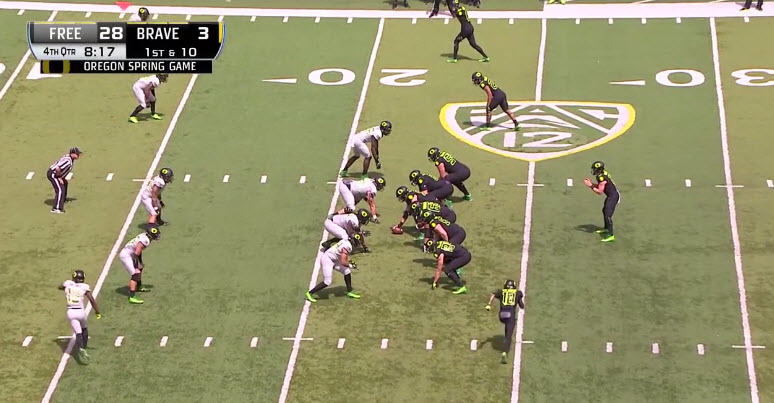 There were so many enjoyable moments to savor in the Oregon Spring Game. Makes me hungry for next year.